Neatly summarising the insights first outlined in his earlier posts examining the merits of contemporary academic conferences, Donald Nicolson imagines a conversation between Plato and Aristotle as the two great thinkers make plans for their forthcoming symposium. 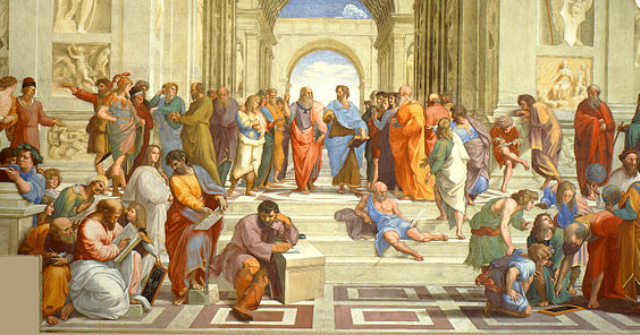 As Plato and Aristotle wandered through the School of Athens, wondering what they could do to improve their upcoming symposium, they hit upon an idea. They had recently heard of a Scottish writer, Donald Nicolson, who had examined conferences in the social sciences and found them to be wanting. “Sometimes they are more trouble than they’re worth,” noted Plato. The two grand thinkers were perplexed. They felt that, based on what Nicolson had suggested, they might be wasting their own and others’ time if the symposium merely generated noise. “What should we do?” asked Plato. He wanted to test his pupil. “Good call,” Plato returned. He was impressed with the maturity of Aristotle. “Should we begin by thinking about human resources, master?” said Aristotle. “Okay, so we will keep it to being a weekday event, Tuesday to Thursday,” Aristotle suggested. “Yes, because the attendees might spend a day travelling to and then from the conference, it will be more helpful to run ours from Tuesday to Thursday so that Monday and Friday can be for transit, and attendees do not lose their weekend. We don’t want delegates from afar having to travel at the weekend, and so interfering with their family life,” Plato motioned. “Oh, that’s a good idea. But what about our choice of venue at the School of Athens?” asked the young protégée. “So, what should we do, master?” enquired Aristotle, sheepishly. “What if we use social media? Would that get around our problems?” Aristotle threw in. “Why is that?” Aristotle wondered if he was displaying student tendencies. “Because, as Nicolson has found, this is where ‘the real work’ of a conference is done; a convivial and relaxed bar is a place to make collaborations, catch up with colleagues, and devise new ideas,” Plato explained. “But master, are there not barriers to that?” Aristotle asked. “Indeed, there are. However, we need to be clear what the purpose of our symposium is. It will not necessarily be a wasted endeavour if it fails to make a difference to the world stage. If it has a personal impact on just one person, then it might still be considered a success,” Plato replied. “So, we need to consider personal outcomes?” asked Aristotle. “Conference attendees are blessed with the chance to travel, master,” Aristotle suggested. “There are more questions than answers, master” said Aristotle. Enlist local politicians and encourage the media to report the conference to raise its public awareness. Donald J. Nicolson is a freelance writer who worked in academic research for 13 years, and gained a PhD in Health Services Research from the University of Leeds. He can be approached on Twitter @the_mopster. His first book, Academic Conferences as Neoliberal Commodities, from which this blog is derived, will publish with Palgrave Macmillan on 4 January 2017 and is available to purchase online. The conference bar and fine wine ? is of course at the heart of the matter. ‘Symposium’ is Greek for ‘drinking party’. ? Cheers. Quite appropriate then that David made his comment on St Patrick’s Day!